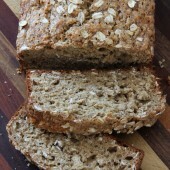 A healthier banana bread recipe, using whole wheat flour and old fashioned oatmeal! In a medium bowl, combine wet ingredients. In a second medium bowl, combine dry ingredients. Slowly mix dry mixture into the wet. Whisk until ingredients are fully incorporated and no streaks remain. Pour batter into a 9x5-inch loaf pan. Lightly sprinkle with additional oats if desired. Bake for 50-55 minutes or until center is set. Cool completely before slicing. Store in an airtight container. Serve with your favorite jams and spreads. Recipe serves roughly 8, yields 1: 9-inch loaf.